Hill LW. The classification of eczematoid eruptions in children with especial reference to contact dermatitis. J Pediatr 1942;20:537-48. Hill LW. The importance of contact eczema in children. Pediatrics 1959;23:797-801. Czarnobilska E, Obtułowicz K, Dyga W, Wsołek-Wnęk K, Śpiewak R. Contact hypersensitivity and allergic contact dermatitis among school children and teenagers with eczema. Contact Dermatitis 2009;60:264-9.
de Waard van der Spek FB, Oranje AP. Patch tests in children with suspected allergic contact dermatitis: a prospective study and review of the literature. Dermatology 2009; 218: 119-25. Mortz CG, Lauritsen JM, Bindslev-Jensen C, Andersen KE. Contact allergy and allergic contact dermatitis in adolescents: prevalence measures and associations. Acta Derm Venereol 2002;82:352-8. Liebhart J, Małolepszy J, Wojtyniak B, Pisiewicz K, Płusa T, Gładysz U. Prevalence and risk factors for asthma in Poland: Results from the PMSEAD study. J Invest Allergol Clin Immunol 2007;17:367-74. Śpiewak R. Wyprysk kontaktowy. Post Dermatol Alergol 2009;26:375-7. Śpiewak R. Patch testing for contact allergy and allergic contact dermatitis. Open Allergy J 2008;1:42-51. Śpiewak R. Testy płatkowe. 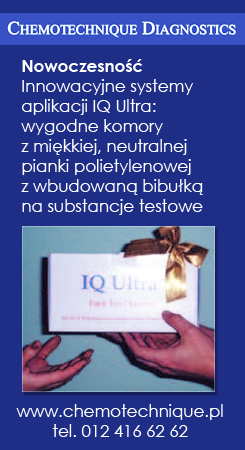 alergologia.biz.pl 2009;1:1-4. Śpiewak R. Atopy and contact hypersensitivity: a reassessment of the relationship using objective measures. Ann Allergy Asthma Immunol 2005;95:61-5. Hanifin JM, Rajka G. Diagnostic features of atopic dermatitis. Acta Derm Venereol Suppl 1980; 92: 44-7. Czarnobilska E, Obtułowicz K, Dyga W, Śpiewak R. The most important contact sensitizers in Polish children and adolescents with atopy and chronic recurrent eczema as detected with the expanded European Baseline Series. Pediatr Allergy Immunol (w druku). Piętowska J, Czarnobilska E, Śpiewak R: The most frequent contact sensitizers and atopic diseases among consecutive patients of a Polish patch test clinic. Allergy 2008; 63 (Suppl. 88): 320. Śpiewak R. Alergia kontaktowa - diagnostyka i postępowanie. Alergia Astma Immunologia 2007;12:109-26.